AFTER THE STORM | Feather Sound News & Beyond! AFTER THE STORM – Feather Sound News & Beyond! As a multi-title pageant holder, Ava ST. Pierre learned how to achieve her best on stage with focus, vigor, poise and exquisite beauty. As a star athlete from age of eleven, Ava learned how to optimize the power of physical strength and mental endurance. But for this gifted woman, life was rarely easy; for most of her childhood, she lived out a secret nightmare. Throughout her teen and young adult years, Ava had to learn how to break the effects of debilitating mental illness that her mother suffered from and effectuated in violence toward her and six siblings. Even as Ava witnessed her mother’s steady decline, and through her attempts to protect everyone in this terrifying path for years, she chose to follow her father’s lead—to live a life of genuine, empathic compassion and enlightenment, helping others survive after their own storm and speaking up for the helpless and haunted. As memories of abuse impress upon the psyche, a heart of love and forgiveness will always pave the way to rise above such chaos. 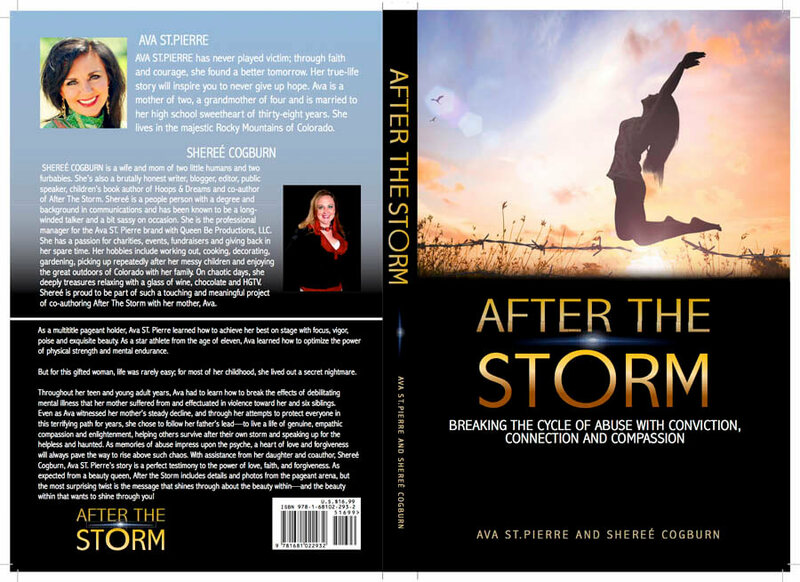 With assistance from her daughter and co-author, Shereé Cogburn, Ava ST. Pierre’s story is a perfect testimony to the power of love, faith, and forgiveness. As expected from a beauty queen, After the Storm includes details and photos from the pageant arena, but the most surprising twist is the message that shines through about the beauty within—and the beauty within that wants to shine through you! situations and I pray for them all. The fact is many cases of violence point towards mental illness. The world needs better mental healthcare. I see these situations in a different light than most due to my personal experiences with a mother deeply affected by mental illness without proper treatment or healthcare. It was a sad and heartbreaking lifestyle for my mother to live and one that stole away my childhood and a family that could have had much happiness if not for her declining mental state. Mental illness and child abuse are subjects no one wants to talk about, but by talking about these issues openly and honestly, we can all help to break the cycles of abuse and mental illness and change the world for the better. If by sharing my story, it helps just one person or 1one family, it was worth the heartache and strength it took to come forward with my once hidden past. It hasn’t been an easy road in sharing my story, in fact, one family member has harassed, stalked, created a smear campaign against me and threatened me not to come forward, but I cannot be deterred. I feel passionate about helping others and spreading awareness for those who have no voice or those who have gone through similar life struggles due to the effects of mental illness or child abuse. Facts: Did you know 1 in 5 adults in the U.S. suffers from some form of Mental Illness? That’s too many at 43.8 million people in a given year. More than 90% of those who die by suicide have a mental health condition.